I am surmising this letter/card was sent in WW1 to soldiers, sailors etc from the Mansfield area. 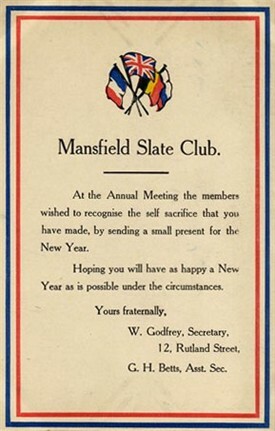 However the Mansfield Slate Club remains a mystery, does anyone know anything about this club, or have further information regarding the sending of the card/letter? This page was added by Pauline Marples on 20/01/2014. A Slate Club is a society whose members contribute small sums weekly or monthly to a fund held by the secretary and shared out at Christmas or on some other special occasion. Slate clubs derived their name from the original practice of chalking the names of the members upon a slate. I cannot find any particular reference to the Mansfield one by checking the local newspaper card catalogue here in the Library; nor is it mentioned in the 1914 Linney's Almanack amongst Oddfellows' Lodges and Friendly Societies. W. Godfrey and G.H. Betts both lived in Rutland Street, so this particular Christmas Club (as we would call it nowadays) may well have covered that area, just off the Nottingham Road. I like the way he has put 'under the circumstances' to refer to the Great War! Hope they all survived. With their heydays from about the mid 1880's through to the mid-late 1940's, Slate Clubs were a 'social service' of their day, established to assist working men who fell on hard times through sickness, unemployment, etc. The headquarters of the Slate Club was almost always in a public house, and those who joined paid a copper or two each week into a fund. Most Slate Clubs held an annual fete, always an eagerly anticipated event, which helped to supplement the club's funds. At Christmas, monies not paid out or loaned were divided equally among the members. Although Slate Clubs no longer exist, they left a lasting legacy with phrases like "put on the slate" (a debt owed) and "the slate wiped clean" (a debt paid).